What do recruiters look for on your CV? Executive recruiters advise. Is your CV working for you? Ahh the humble CV… How drastically it has changed since Leonardo da Vinci listed his skills and capabilities down on that archaic medium known as paper in 1482. Yet, the reasoning behind the CV has changed very little and it’s safe to say that any predictions of the demise of the CV are perhaps a little short-sighted. Curriculum vitae is a Latin expression which can be translated as ‘the course of my life’. Research into the senior level jobs market found that a ‘poor quality CV’ is one of the most significant obstacles candidates face in their job search. Recruiters consistently find that many senior executives have difficulties communicating their value. It’s probably the reason you’re not getting enough job interviews! It’s hardly surprising that so many intelligent individuals are struggling with crafting a compelling CV. The subject itself is as likely to start a debate as lively as any discussion around politics or world peace. It doesn’t seem to matter who you talk to, everyone has an opinion – and a different idea of how a CV should be constructed. With all these conflicting views, how can you possibly know which format will bring you the opportunities you want? 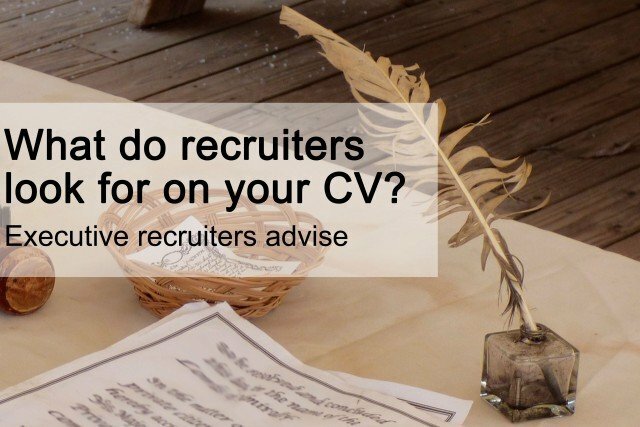 What do recruiters look for on your CV? How can you stand out from the crowd and create a CV that will be read and acted upon by a recruiter? We spoke with a number of executive level recruiters to discover the mistakes that senior executives commonly make on their CV – and how you can create a better, more compelling CV that recruiters will want to take the time to read. Of course, there are many variables to consider with regard to constructing your CV. For example, if you’re seeking a new role in the same industry, you’ll want to highlight relevant previous experience. However, if you’re seeking a career change you might lead with your transferable skills and accomplishments rather than career history. You’ll also be aware of some cultural and country variations around CV practices. But, don’t get too hung-up on the countless CV tips you see; sift through available information on CV writing and apply what works for you. What’s most important is that you explore your options and gain feedback on your CV to ensure you end up with a document that gets you the results you need. For more on writing CVs, download our report: The Executive Job Search: How to craft a compelling CV. If you would like to discuss your CV, feel free to contact us at contact@executiveconnexions.com or call +44 (0) 203 384 4188.